Samsung launched Galaxy On8 Smartphone for India which is rebranded Galaxy J8 which was launched last month. 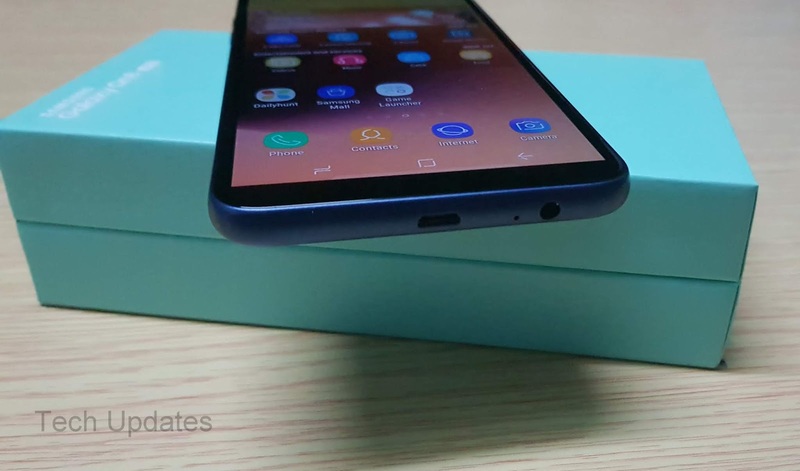 Samsung Galaxy On8 comes with Infinity Display & Dual Rear Camera, Here's Unboxing, Photo Gallery and First Look at Galaxy On8 smartphone. 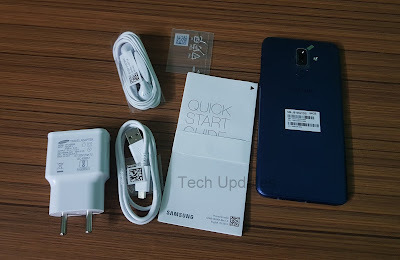 Samsung Galaxy On8 Box Content Include SIM Tool, User Guide, Warranty Information, 2-Pin Wall charger 5V 1.5A, Earphone, USB Cable. Samsung Galaxy On8 comes with plastic body same as Galaxy J6. 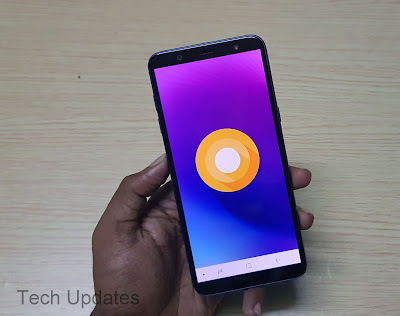 It comes with a 6-inch (1480 x 720 pixels) HD+ Super AMOLED 18.5: 9 Infinity Display, On the front, there is 16MP front facing camera with LED, earpiece there is No notification LED and On Screen buttons. The power button and Speaker on Right, 3.5mm Audio Jack, Micro USB port on Bottom, On Bottom we have Volume rockers, Dual SIM+ Dedicated MicroSD card slot. 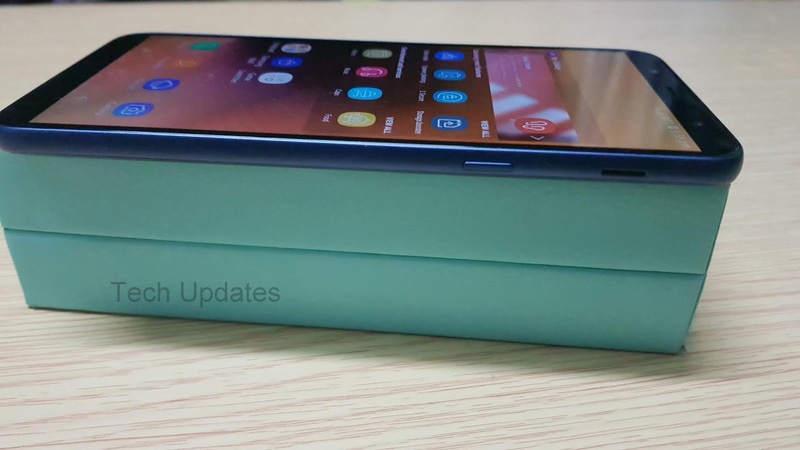 On the Rear, It has a 16+ 5MP Dual Rear camera, Fingerprint Scanner, and Samsung branding, Rear has slightly curved edges which gives good grip in Hand at This price Samsung should have provided metal body. Samsung Galaxy On8 comes with 1.8GHz Octa-Core Snapdragon 450 14nm Mobile Platform with Adreno 506 GPU. 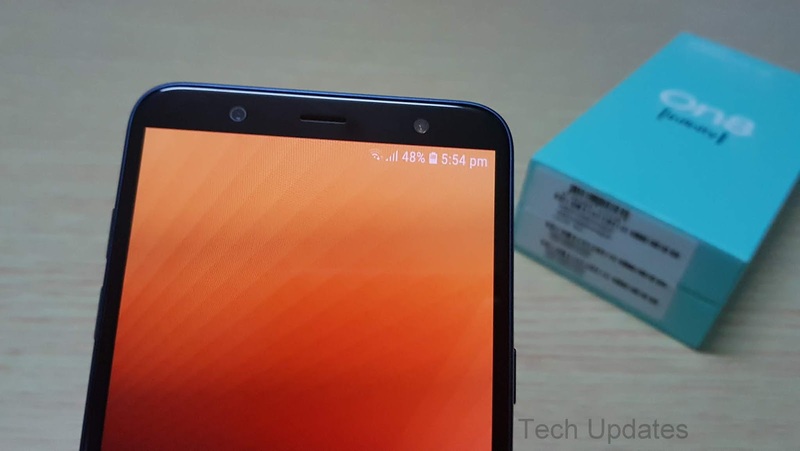 It has 4GB RAM, 64GB internal storage out of which around 50GB is available for the user expandable memory up to 256GB with microSD. It runs on Android 8.0 Oreo with Samsung Experience UI 9.0. On Camera, It has a 16MP rear camera with LED flash, f/1.7 aperture, secondary 5MP camera with f/1.9 aperture and 16MP front-facing camera with LED flash, Both can record videos up to 1080P and has support for depth mode. 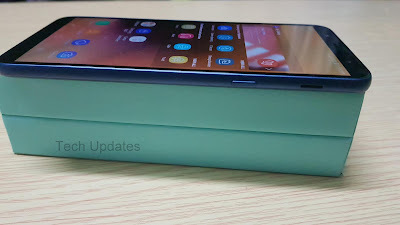 Connectivity Options include 4G VoLTE, Wi-Fi a/b/g/n (2.4/5GHz), Bluetooth 4.2 LE, ANT+, GPS Packed with a 3500mAh battery which does not support fast charging. 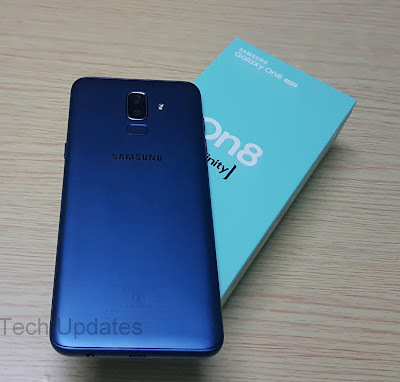 Samsung Galaxy On8 comes in Blue and Black color priced at Rs 16,990. At this price, it comes with HD+ Display, Plastic Body, Snapdragon 450 Processor and No fast charge Support.